In a Nutshell: Fairfield County Bank serves one of the wealthiest counties in the U.S. But as its population increases, the county faces new challenges, which is why Fairfield County Bank invests in small businesses, organizations, and causes that boost the local economy and help local residents. In 2018, the bank donated $1 million to nearly 350 organizations chosen by employees and logged more than 4,000 volunteer hours. Fairfield County Bank, established in 1871, also looks for opportunities to support the underprivileged and engage its customers in giving back. For its dedication to those ideals, we’ve recognized Fairfield County Bank with our Editor’s Choice™ Award for Community Commitment. Located just 50 miles northeast of New York City, Connecticut’s Fairfield County is not only rich in history but also material wealth. Fairfield County is home to some of the state’s largest cities and is ranked the seventh wealthiest U.S. county per capita, according to USA Today, with the majority of this concentrated in its Gold Coast. It’s easy to see why people want to live in Fairfield County, which has experienced a 3.1% increase in population over the last five years. But jobs, as well as property values, have struggled to keep pace during the most recent economic expansion. In the face of high taxes, debt, and the challenges faced by at-risk demographics, even Fairfield County needs financial institutions that reinvest in the community. Fairfield County Bank is an institution that is committed to helping everyone in the county grow and thrive — both personally and financially. Fairfield County Bank’s Stephen Wooters spoke with us about the institution’s mission to enhance communities. Fairfield County Bank was first established as Ridgefield Savings Bank in 1871, and its rich history includes a link to the early days of baseball — America’s pastime. The bank’s first president, Daniel Lucius “Doc” Adams, is credited with writing many of the original rules for the game. Today, Fairfield County Bank is known for its strong leadership in the community through small-business-friendly lending practices, educational programs, volunteerism, and charitable giving. Now approaching its 150th anniversary, Fairfield County Bank is a $1.5 billion organization with 21 locations and branches in 11 communities. For its efforts to invest its assets in the people and businesses of Connecticut, Fairfield County Bank has earned our Editor’s Choice™ Award for Community Commitment. Fairfield County Bank is aware of the potential for successful small businesses and organizations to cause a ripple effect that can produce new jobs and stimulate the local economy. That is why it strongly supports SMBs with a wide range of business, banking, and financial services. “Statistics have shown that for every $40,000 in business loans, one local job is created,” Stephen said. Stephen worked with global banks before entering the community banking space about three years ago, so he sees how Fairfield County Bank — and the community bank model, in general — differs in its approach with smaller business clients. “When you’re talking about the regionals, nationals, and global banks, the money is going where they see the biggest opportunities, and that might not be in their own backyard,” he said. And when business clients struggle, large corporate lenders are also more likely to cut their losses and move on. Besides business loans and lines of credit, Fairfield County Bank actively looks for opportunities to help Fairfield County-area organizations raise capital for promising projects. That led to the bank’s involvement with the Keeler Tavern Museum, a historical organization in Ridgefield. 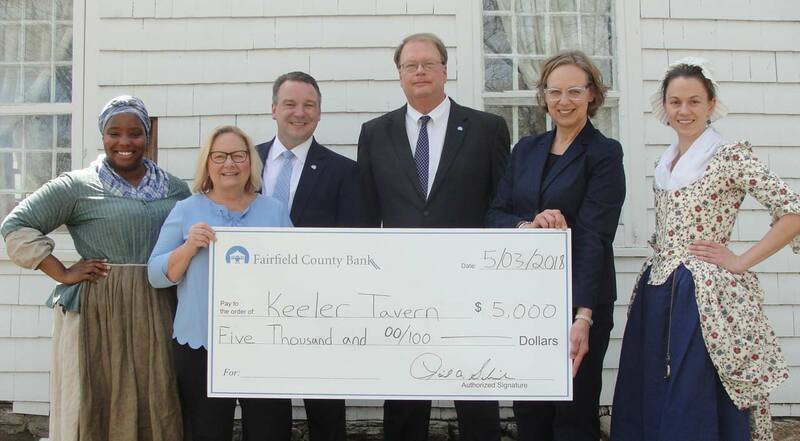 The bank helped Keeler Tavern Museum by fundraising on its behalf and through donations. The Keeler Tavern Museum commemorates the site of Connecticut’s only inland battle of the Revolutionary War and makes history come alive for locals, tourists, and school groups. When the museum looked into purchasing an adjacent historic property in 2016, Fairfield County Bank, where Stephen sits on the board of trustees, got involved. The capital campaign continues to fund an all-new visitor’s center and the transformation of the museum into a regional history hub through 2020. Fairfield County Bank is listed among the donors who have contributed $50,000-$99,000, to date. “We’re the bank that came in and helped them get the financing they needed, and then supported their capital campaigns along the way to ensure that the organization — which is a 300-year-old property — is still there and can teach civics and the importance of being involved in the community,” Stephen said. Fairfield County Bank is committed to helping area organizations and businesses thrive in the long term and supporting its communities by providing services and promoting growth. Fairfield County Bank is relatively small, yet its charitable donations total upward of $1 million every year, spread out among nearly 350 local nonprofits and community programs. And, while the leadership team plays a role, Fairfield County Bank employees typically initiate involvement with these organizations and personally contribute their time and efforts in the form of hundreds of volunteer hours. In an age when employees and customers gravitate to businesses that align with their values, Fairfield County Bank draws the types of employees who prioritize community service. And by encouraging employees to pursue their passions, the bank makes them feel valued. That’s one of the reasons an anonymous survey of employees by the Connecticut Media Group ranked Fairfield County Bank one of the top workplaces in the state. 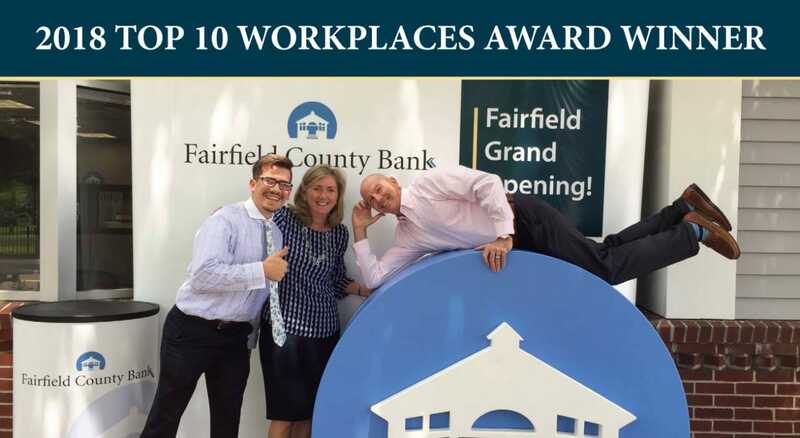 Fairfield County Bank was voted one of Connecticut’s top 10 workplaces in 2018. Fairfield County Bank supports causes that include Danbury Hospital cancer research, the Ridgefield Visiting Nurses Association, and a number of organizations that provide job training and community support for mentally and physically disabled residents, including local organizations like STAR, Inc. and Ability Beyond Disability. “We also fund local organizations like Bridgeport’s Sheehan Center, as well as Paul Newman’s Hole in the Wall Gang, which is a major supporter of underprivileged youth,” Stephen said. The $1 million Fairfield County Bank donates to these and other organizations each year — almost twice its advertising budget — demonstrates its priorities and commitment to supporting its communities. “You could only imagine what it’d be like if all the banks around the U.S. did this,” Stephen said. While parts of Fairfield County are affluent, others are home to vulnerable demographics in need of financial guidance. Those populations include underprivileged youth who receive little financial education and the elderly — who are prime targets for identity-theft scams. To help these groups learn how to handle money and avoid financial pitfalls, Fairfield County Bank hosts many community education programs and events. Fairfield County Bank Security Advisor Dan McGran teaches classes on cybersecurity in the community. “A lot of the topics we talk about revolve around cybersecurity. We bring people in and share our expertise on how to ensure you don’t get hacked and what to do to protect yourself from identify theft,” Stephen said. 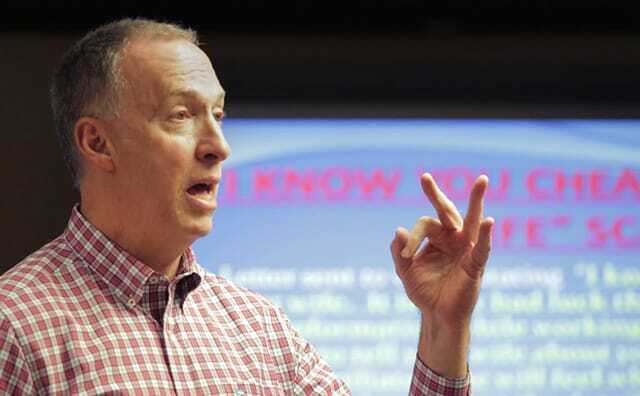 One of these programs features retired Police Major Dan McGran, now Fairfield County Bank’s Security Advisor, who teaches free classes and seminars for seniors and other adults to help them understand financial fraud. “He gives people a good sense of what is and isn’t a scam,” Stephen said. Fairfield County Bank also emphasizes education for underprivileged youth, who may have little experience with money, jobs, or bank accounts. “We help them early on so they can learn how to establish their credit, open their first account, and build their financial profile,” Stephen said. As Fairfield County continues to expand and face unique economic challenges, Fairfield County Bank is making a difference by investing back in individuals, organizations, and local businesses that are vital to the community’s growth and success. To expand its giving impact and engage more people, Fairfield County Bank started the Charity of the Month Program, that allows customers to vote on which organization receives an additional $1,000 donation each month of the year. “Each month we create a theme. The month of March is National Women’s History Month, so we chose four women-focused organizations: the League of Women’s Voters of Ridgefield, the Women’s Center of Danbury, the Weston Women’s League, and the Women’s Business Development Council,” Stephen said. The bank intends to build on the program and get other organizations involved, as well. Customers who wish to participate can fill out an entry card at any one of its 16 branch office locations, over the phone, or online. Already, customers have responded well to the program, which reflects Fairfield County Bank’s strong commitment to community involvement. “That’s why people bank with us. The community is constantly thanking us, and we appreciate every bit of it,” Stephen said. For its employee volunteerism, charitable donations, financial education, and overall engagement, we recognize Fairfield County Bank with our Editor’s Choice™ Award for Community Commitment.